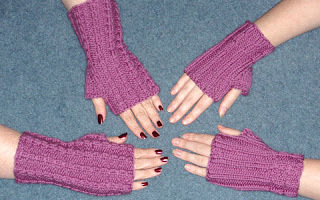 Jejune's Place: Mission - Wristwarmers! Last year my Secret Pal Abbey sent me 2 balls of Mission Falls machine washable wool - it's the softest stuff! I finally found the perfect project - a pair of A Little Twist Wristwarmers. They're a quick knit! Then Dotter tried them on - now, she finds most wool things itchy, even sock yarn bothers her. So when she realised that she could wear Mission Falls on her skin with NO itching - well, the pressure was on. But I refused to give her my lovely new wristwarmers, even though she kept stealing them! 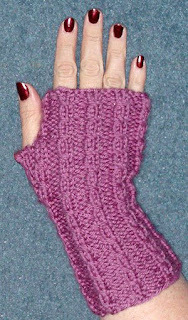 The only modification I'd do (and I figured this out a year ago when I first knit them, and then forgot about it, duh), is to make the thumb opening a little more snug - it's a bit 'gappy'. 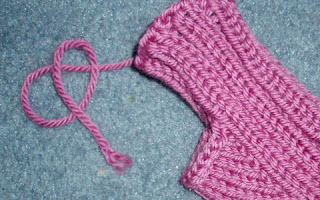 When casting off the thumb gusset, cast off 1 stitch less than called for (ie 12 instead of 13) and then in the next row knit the extra un-cast-off-stitch (ie on the *left* side of the gusset) in with the last stitch on the *right* edge of the gusset - this helps to close up the hole that appears otherwise. It's Jejune Day again today! I reinstated this last week, after nearly going nuts again. It's SO GOOD. Helping keep me sane(r) and happy. Good thinking on the second pair! They both look fabulous. very nice! Fab that you managed to get two pairs out of the yarn too. The wristwarmers are lovely ( an yours are nicer I think!!!) I love your fingernails, you look so elegant!!! Wasn't the Crazu Unicorn wearing a pair just like Dotter's? Unicorns wear wrist-warmers! Lovely knitting! very nice. And hooray for Jejune Day!!!! Gapping thumb holes? Not too gappy if you're wearing a thumb ring. Oh, yay for re-installing Jejune Day! And those wristwarmers are great! they look so good. I'm itching to make them too! both very very noice and I suppose that I'll have to start looking for Mission Falls now - being another mother of a daughter who has trouble with itchy wool. I love Mission Falls as well. Gorgeous stuff! I'm glad you reinstated Jejune Day. After all you've been through, you deserve the break.